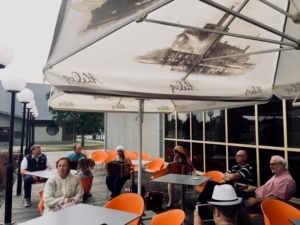 Our last stop in Latvia was in the town of Ainazi, close to the Estonian border. 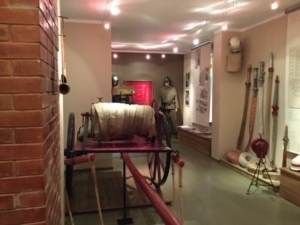 We had a visit to the firefighting museum, celebrating the voluntary firefighting association which has a long history in the town. It also celebrated cooperation with the Netherlands who still provide material support for these services. Being a border town, it had some large stores attracting, with lower taxes, customers from neighbouring countries. These stores also sold local products with the hope to attract people to spend more time in the area. We also had the opportunity to present our eminbus and to gather more signatures. Then, it was the time to say good bye to our Latvian colleagues and take the road to our first stop in the town of Märjamaa, Estonia. We arrived and were immediately welcomed with a fine lunch in the impressive community centre in the town. We were also welcomed by the Mayor, town officials and representatives from the social and health services. Local musicians provided entertainment. 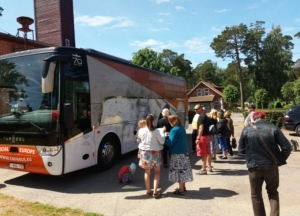 After the welcome we had the opportunity to present the #eminbus and to engage with an exchange about life in Märjamaa. Concerns were expressed about the influence of large corporations on local community life and the seeming inability of Governments and indeed the EU Institutions to even want to do something to control the negative impacts. The low levels of pensions, after a lifetime of hard work, was also highlighted. We were also told of efforts to introduce a more progressive tax system in the country which was heavily criticised in the media but now some of the benefits in terms of fighting poverty are coming to light. Ensuring fair taxation and tax avoidance is key to the fight against poverty and exclusion. 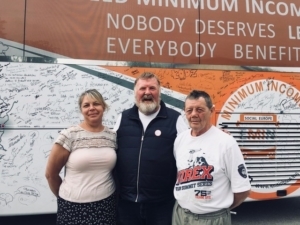 One of the joys of the EMIN bus journey is to show that the EU is not just about capital cities but must also engage smaller local communities.